Hyderabadi recipes have its roots in very well known Mughlai cuisine. One such delicious recipe from it is double ka meetha, crisp bread pieces soaked into sugar syrup and then topped with saffron and cardamom flavored milk rabri. It is very easy to prepare with simple ingredients like bread, milk, cream and sugar. The use of saffron and cardamom adds a nice flavor, aroma and color to its overall appeal. Follow the given step by step photo recipe to make it at home. 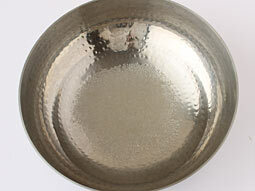 Heat milk on medium flame in a non-stick or heavy based pan. When it comes to a boil, reduce flame to low and cook until milk quantity is reduced to half (around 1 cup) and turns thick. Stir in between occasionally to prevent sticking. Add saffron strands and cardamom powder and mix well. Turn off the flame and transfer it to a bowl. Let it cool at room temperature. Place it in the refrigerator until required. 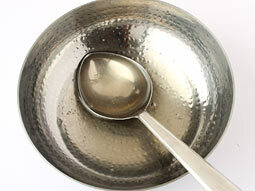 Take water and sugar in a pan to prepare the sugar syrup. Boil it over medium flame until slightly thick and sticky or slightly 1-string consistency syrup for approx. 5-6 minutes. Stir in between occasionally. Turn off the flame. Sugar syrup is ready. 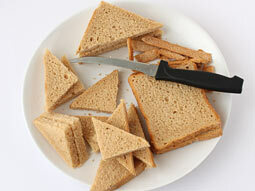 Remove edges of bread slices and cut each slice into 2 triangles. 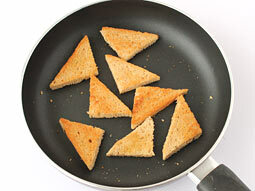 Note: Do not cut bread slices into triangles if you are using the third option in next step. Now make the breads crispy. To make them crispy, you can deep fry, shallow fry or toast them. Use any one of the following three methods. Heat ghee in a deep pan over medium flame. When it is hot enough to deep fry, add bread pieces and fry them until crispy and turn golden brown on both sides. 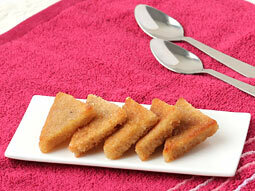 Place deep fried breads on a paper napkin to remove excess ghee. Brush bread pieces with ghee. Shallow fry them in a non-stick pan or tava over medium flame until crispy and golden brown on both sides. This method will take a longer time to crisp the bread compared with deep-frying method. However, it is a much healthier method to avoid excess ghee. Toast bread slices in a toaster. 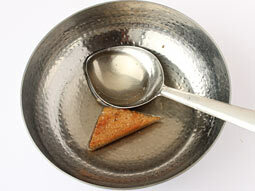 Apply ghee with brush over both sides of each toased bread slice and then cut into triangles. In this recipe, bread is shallow fried to reduce the calorie of the dish. Dip each crispy bread pieces into prepared sugar syrup. Arrange them in a deep serving plate. 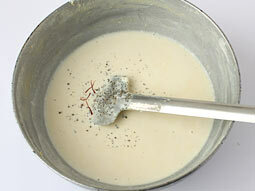 Pour thickened milk (prepared in step-2) over it. Garnish double ka meetha with almonds, raisins and cashew nuts. Serve it at room temperature or place it in refrigerator for 30 minutes to chill before serving. You can cut off the edges of bread slices if desired but it does not make much difference after frying them. Roast dry fruits in ghee for a minute before garnishing for crispy taste. 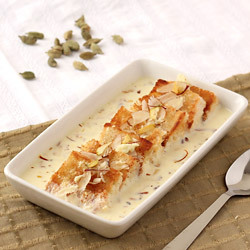 Prepare double ka meeta within few minutes by following the recipe of shahi tukda with condensed milk. You can avoid preparing the sugar syrup and dipping bread slices in it. Instead, mix sugar (as per your taste) in milk in step 2. 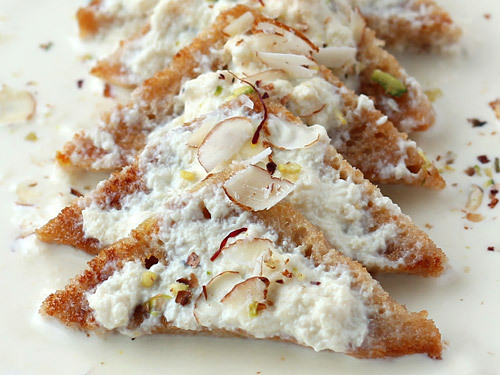 Serving Ideas: Serve double ka meetha as a dessert after dinner. Vry nice and simple recipe... Yummy. Can we eat double ka meetha after 3 days of preparation? I mean for how many days can we preserve it in the fridge? Response: Hello Sandeep, you can keep the double ka meetha for 3-4 days in refrigerator. You can prepare the rabdi in advance and keep in the refrigerator. Pour the rabdi over bread pieces at the time of serving. It's wrong recipe, In hyderabad we don't fry on pan, we deep fry the bread in vanaspathi or Ghee. We make sure to add muskmelon seeds and khaju and we pour desi ghee on topping. Please keep original recipe. Response: Hi Sunesh, thank for sharing the info. We have already posted both the methods (shallow fry / deep fry) to fry the bread in this recipe. All the recipes are awesome and it's very easy to learn. Thanks a lot. Is it okay if I skip saffron? Response: Yes, it is ok. Please let me know whether condensed milk can be used in hot condition? Response: Yes, you can heat the condensed milk (you can add condensed milk while making rabri or halwa and cook it). Can we use condensed milk instead of fat milk? What is the difference between the two? Please let me know since I have decided to make this tomorrow. Response: Hi Shubhangi, full fat milk is another name of whole milk (normal milk with regular fat content) which we use in daily routine. Condensed milk is sweet and thicker compared to regular milk. It is easily available in any grocery store and can be stored for many days in refrigerator. 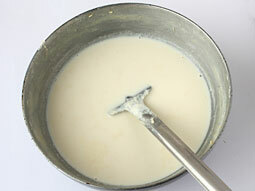 If you use the condensed milk then you will also need less time to make rabri. If you want to make this dessert using condensed milk then follow this recipe to make rabri using condensed milk. This site is absolutely fantastic. One can try any dish without hesitation. The outcome will be delicious, finger liking good. Too tasty. Really didn't expect this. Which ever dish I tried out seeing any websites turned out a disaster and this one was really great in taste. My family loved it and it's really easy to make. Response: Thanks Usha for positive feedback. Prepared this for Father's Day and my hubby loved it!!! If was yummy!!! Very heavy and high in calories though! ???? Response: Yes, this dessert/sweet is high in calories but it's all right to eat it on special occasions. I love to make and serve it.